Not to be confused with Māori people, Maouri people, or Mauri people. This article is about the Moriori people. For the language, see Moriori language. The Moriori are the indigenous Polynesian people of the Chatham Islands (Rēkohu in Moriori, Wharekauri in Māori), New Zealand. Moriori originated from Māori settlers from the New Zealand mainland around the year 1500. This was near the time of the shift from the Archaic to Classic Māori culture on the main islands of New Zealand. Oral tradition records multiple waves of migration to the Chatham Islands. Over several centuries these settlers' culture diverged from mainland Māori, developing a distinctive dialect, mythology, artistic expression and way of life. 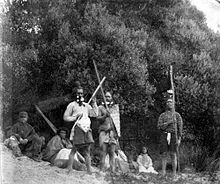 Early Moriori formed tribal groups based on eastern Polynesian social customs and organisation; later, a prominent pacifist culture emerged (see Nunuku-whenua). This culture made it easier for Taranaki Māori invaders to nearly exterminate them in the 1830s during the Musket Wars. Currently there are around 700 people who identify as Moriori, most of whom no longer live on the Chatham Islands. During the late 19th century some prominent anthropologists proposed that Moriori were pre-Māori settlers of mainland New Zealand, and possibly Melanesian in origin. This hypothesis was taught in New Zealand’s schools for most of the 20th century, long after it had fallen from favour among academics. The Moriori are ethnically Polynesian. They developed a distinct Moriori culture in the Chatham Islands as they adapted to local conditions. 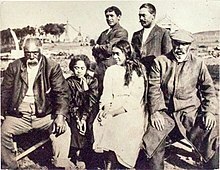 Although speculation once suggested that they settled the Chatham Islands directly from the tropical Polynesian islands, current research indicates that ancestral Moriori were Māori Polynesians who emigrated to the Chatham Islands from mainland New Zealand around 1500. Evidence supporting this theory comes from the characteristics that the Moriori language has in common with the dialect of Māori spoken by the Ngāi Tahu tribe of the South Island, and comparisons of the genealogies of Moriori ("hokopapa") and Māori ("whakapapa"). Prevailing wind patterns in the southern Pacific add to the speculation that the Chatham Islands were the last part of the Pacific to be settled during the period of Polynesian discovery and colonisation. The word Moriori derives from Proto-Polynesian *ma(a)qoli, which has the reconstructed meaning "true, real, genuine". It is cognate with the Māori language word Māori and likely also had the meaning "(ordinary) people". Moriori designs carved into trees and rock. The Chathams are colder and less hospitable than the land the original settlers left behind, and although abundant in resources, these were different from those available where they had come from. The Chathams proved unsuitable for the cultivation of most crops known to Polynesians, and the Moriori adopted a hunter-gatherer lifestyle. Food was almost entirely marine-sourced — protein and fat from fish, fur seals, and the fatty young of sea birds. The islands supported about 2,000 people. As a small and precarious population, Moriori embraced a pacifist culture that rigidly avoided warfare, replacing it with dispute resolution in the form of ritual fighting and conciliation. The ban on warfare and cannibalism is attributed to their ancestor Nunuku-whenua. ...because men get angry and during such anger feel the will to strike, that so they may, but only with a rod the thickness of a thumb, and one stretch of the arms length, and thrash away, but that on an abrasion of the hide, or first sign of blood, all should consider honour satisfied. Moriori castrated some male infants in order to control population growth. The first Europeans to make contact with the Moriori were the crew of HMS Chatham on 29 November 1791, while on its voyage to the northern Pacific from England, via Dusky Sound. The Chatham's captain, William R. Broughton, named the islands after his ship and claimed them for Great Britain. The landing party came to shore in Kaingaroa Harbour on the far Northeast coast of Chatham Island. The Moriori at first retreated into the forest once the Europeans landed. Seventy years later the Europeans would be recalled in Moriori oral tradition as containing the god of fire, given the pipes they were smoking and likely female from the clothes they were wearing. It was this interpretation that led to the men returning from the forest to meet the landing party. A brief period of hostility was quickly calmed by the crew putting gifts on the end of Moriori spears, though attempts at trade were unsuccessful. After exploring the area for water the crew again became fearful of Moriori aggression. Some misunderstanding led to an escalation of violence and one Moriori was shot and killed. HMS Chatham then left the island with all its crew. Both the diary of Broughton and local oral tradition record that both sides regretted the incident and to some extent blamed themselves for overreacting. It was this regret in part that led to good relations when the next ships arrived in the islands sometime between 1804 and 1807. They were sealers from Sydney and word of their welcome soon gave the Moriori a reputation of being friendly. During this time at least one Moriori visited the New Zealand mainland and returned home with knowledge of the Māori. As more ships came, sealing gangs were also left behind on the islands for months at a time. Sealers and whalers soon made the islands a centre of their activities, competing for resources with the native population. Pigs and potatoes were introduced to the islands. However, the seals that had religious significance and provided food and clothing to the Moriori were all but wiped out. European men intermarried with Moriori. Māori arrivals created their own village at Wharekauri which became the Māori name for the Chatham Islands. The local population was estimated at about 1,600 in the mid-1830s with about 10% and 20% of the population having died from infectious diseases such as influenza. The effects of influenza were made more serious by the habit, also common to the Māori, of immersion in cold water. Moriori people in the late 19th century. In 1835 some displaced Ngāti Mutunga and Ngāti Tama, from the Taranaki region, but living in Wellington, invaded the Chathams. On 19 November 1835, the brig Lord Rodney, a hijacked European ship, arrived carrying 500 Māori (men, women and children) with guns, clubs and axes, and loaded with 78 tonnes of potatoes for planting, followed by another load, by the same ship, of 400 more Māori on 5 December 1835. Before the second shipment of people arrived, the invaders killed a 12-year-old girl and hung her flesh on posts. They proceeded to enslave some Moriori and kill and cannibalise others. With the arrival of the second group "parties of warriors armed with muskets, clubs and tomahawks, led by their chiefs, walked through Moriori tribal territories and settlements without warning, permission or greeting. If the districts were wanted by the invaders, they curtly informed the inhabitants that their land had been taken and the Moriori living there were now vassals." A hui or council of Moriori elders was convened at the settlement called Te Awapatiki. Despite knowing of the Māori predilection for warfare, and despite the admonition by some of the elder chiefs that the principle of Nunuku was not appropriate now, two chiefs — Tapata and Torea — declared that "the law of Nunuku was not a strategy for survival, to be varied as conditions changed; it was a moral imperative." Although this council decided in favour of peace, the invading Māori inferred it was a prelude to war, as was common practice during the Musket Wars. This precipitated a massacre, most complete in the Waitangi area followed by an enslavement of the Morori survivors. A Moriori survivor recalled : "[The Māori] commenced to kill us like sheep.... [We] were terrified, fled to the bush, concealed ourselves in holes underground, and in any place to escape our enemies. It was of no avail; we were discovered and killed – men, women and children indiscriminately." A Māori conqueror explained, "We took possession... in accordance with our customs and we caught all the people. Not one escaped....."  The invaders ritually killed some 10% of the population, a ritual that included staking out women and children on the beach and leaving them to die in great pain over several days. During the following enslavement the Māori invaders forbade the speaking of the Moriori language. They forced Moriori to desecrate their sacred sites by urinating and defecating on them. Moriori were forbidden to marry Moriori or Māori, or to have children with each other. Which was different from the customary form of slavery practiced on mainland New Zealand. However, many Moriori women had children by their Māori masters. A small number of Moriori women eventually married either Māori or European men. Some were taken from the Chathams and never returned. In 1842 a small party of Māori and their Moriori slaves migrated to the subantarctic Auckland Islands, surviving for some 20 years on sealing and flax growing. Only 101 Moriori out of a population of about 2,000 were left alive by 1862. 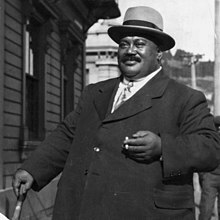 Tommy Solomon, acknowledged as the last Moriori of unmixed ancestry. The Moriori were free from slavery by the end of the 1860s which gave them opportunities for self determination, but their small population led to a gradual dilution of their culture. Only a handful of men still understood the Moriori language and culture from before the invasion. The younger generation spoke Māori, while still identifying themselves as Moriori. While attempts were made to record the Moriori culture for posterity, it was generally believed that it would never again be a living way of life. By 1900 there would only be twelve people in the Chatham Islands who identified themselves as Moriori. Although the last Moriori of unmixed ancestry, Tommy Solomon, died in 1933, there are several thousand mixed ancestry Moriori alive today. In the late 1980s some Moriori descendants made claims against the New Zealand government through the Waitangi Tribunal. The Tribunal is charged with making recommendations on claims brought by Māori relating to actions or omissions of the Crown in the period since 1840, which breach the promises made in the Treaty of Waitangi. These claims were the first time the Tribunal had to choose between competing claims of two indigenous groups. The main focus of the claim was the British annexation of the islands in 1842, the inaction of the Government to reports of Moriori being kept in slavery and the awarding of 97% of the islands to Ngati Mutunga in 1870 by the Native Land Court. In 1992, while the Moriori claim was active, the Sealords fisheries deal ceded a third of New Zealand's fisheries to Māori, but prevented any further treaty fishery claims. This occurred against the backdrop of Māori, Moriori and Pākehā Chatham Islanders all competing for fishing rights, while working together to exclude international and mainland interests. Therefore it was believed that the result of the Tribunals verdict on the ownership of the Chatham Islands may improve the Moriori ability to acquire some of the allotted fishing rights from the Sealords deal. The Moriori claims were heard between May 1994 and March 1996 and the verdict was strongly in favour of the Moriori case. This in turn lead to an $18 million deal between the Crown and Moriori in 2017. Today, despite the difficulties that the Moriori have faced, their culture is enjoying a renaissance, both in the Chatham Islands and New Zealand's mainland. This has been symbolised with the renewal of the Covenant of Peace at the new Kōpinga marae in January 2005 on Chatham Island. As of 2016, the marae has registered almost 800 Moriori descendants, with more than 3000 associated children. The Kopinga meeting place and Hokomenetai meeting house are based in the town of Waitangi, also on Chatham Island. In 2001 work began on preserving the vocabulary and songs of the Moriori people. They also received a $6 million grant to preserve their culture and language from the Government. The Albatross remains important in Moriori culture: it is seen in the design of the Kōpinga marae and its feathers are worn in the hair of some Moriori as a sign of peace. The relationship between the Moriori and Ngati Mutunga is improving, and non-violence remains a cornerstone of the Moriori self image. In 2002 land on the east coast of Chatham Island was purchased by the crown (the Taia property). It is now a reserve and jointly managed by Moriori and the Crown. The Moriori are also actively involved with preserving the rākau hokoairo (tree carvings) on the islands. English and to a lesser extent Māori are spoken by Moriori today. The now extinct Moriori language was Eastern Polynesian and closely related to Māori and Cook Island Māori with which it was mutually intelligible. It shared about 70% of its vocabulary with Māori, however, there were also significant differences in grammar and pronunciation. There are modern attempts at creating learning materials to ensure the survival of what remains of the language. In 2001 the two main political groups of Moriori united to form the Hokotehi Moriori Trust, however, some internal deputes remain. The New Zealand Government recognises the Hokotehi Moriori Trust as having the mandate to represent Moriori in Treaty of Waitangi settlement negotiations. It is also a mandated iwi organisation under the Māori Fisheries Act 2004 and a recognised iwi aquaculture organisation in the Māori Commercial Aquaculture Claims Settlement Act 2004. The trust represents Moriori as an "iwi authority" for resource consents under the Resource Management Act 1991, and is a Tūhono organisation. The charitable trust is managed by ten trustees, with representation from both the Chatham Islands, and the North Island and South Island. It is based at Owenga on Chatham Island. Based on the writing of Percy Smith and Elsdon Best from the late 19th century, theories grew up that the Māori had displaced a more primitive pre-Māori population of Moriori (sometimes described as a small-statured, dark-skinned race of possible Melanesian origin), in mainland New Zealand – and that the Chatham Island Moriori were the last remnant of this earlier race. These theories also had the advantage – from the view of the European settlers – of undermining the notion of the Māori as the indigenous people of New Zealand, making them just one in a progression of waves of migration and conquest by increasingly more civilised and technically able peoples. This in turn was used to justify racist stereotyping, colonisation, and conquest by cultural "superiors". However, the hypothesis of a racially distinct pre-Māori Moriori people was examined and rejected by a number of historians, anthropologists and ethnologists, among them, anthropologist H.D. Skinner in 1923, ethnologist Roger Duff in the 1940s, and historian and ethnographer Arthur Thomson in 1959, as well as Michael King in Moriori: A People Rediscovered in 2000 and James Belich and K.R. Howe in Te Ara: The Encyclopedia of New Zealand. The idea of Moriori arriving earlier and being vastly distinct from Māori was widely published in the early twentieth century. Crucially, this story was also promoted in a series of three articles in the School Journal of 1916, and the 1934 A. W. Reed schoolbook The Coming of the Maori to Ao-tea-roa  —and therefore became familiar to generations of schoolchildren. This in turn has been repeated by the media and politicians. However, at no point has this idea completely dominated the discussion, with the academic consensus slowly gaining more public awareness over the 20th century. One of the plots of the 2004 British novel (and 2012 American film) Cloud Atlas featured the slavery of Moriori on the Chatham Islands in the mid 19th century. Some reviews drew attention to the inappropriateness of using motifs from African slavery in the United States of America to represent Māori slave culture. The interchangeability of these two practices has been a common misconception in the popular imagination. Wikimedia Commons has media related to Moriori. ^ a b c d "Moriori Population and Geography". stats.govt.nz. Statistics New Zealand. Retrieved 5 March 2016. ^ Taonga, New Zealand Ministry for Culture and Heritage Te Manatu. "1. – Moriori – Te Ara Encyclopedia of New Zealand". teara.govt.nz. Retrieved 13 December 2018. ^ Anderson, Atholl (2016). "The making of the Maori middle ages". Journal of New Zealand Studies (23): 2. ^ Barber, Ian (1995). "Journal of the Polynesian Society: Constructions Of Change: A History Of Early Maori Culture Sequences, By Ian Barber, P 357-396". www.jps.auckland.ac.nz. Retrieved 13 December 2018. ^ Taonga, New Zealand Ministry for Culture and Heritage Te Manatu. "2. – Moriori – Te Ara Encyclopedia of New Zealand". teara.govt.nz. Retrieved 13 December 2018. ^ Richards 2018, pp. 73–76. ^ Seymour, Maud Ella (1924). "A history of the Chatham Islands". Maud Ella Seymour. ^ King 2000, pp. 26, 177. ^ Rekohu: A Report on Moriori and Ngati Mutunga Claims in the Chatham Islands. https://forms.justice.govt.nz/search/Documents/WT/wt_DOC_68595363/Rekohu%20Report%202016%20Reprint.pdf: Waitangi Tribunal Report. 2001. ^ Taonga, New Zealand Ministry for Culture and Heritage Te Manatu. "6. – Moriori – Te Ara Encyclopedia of New Zealand". teara.govt.nz. Retrieved 13 December 2018. ^ Shapiro, HL (1940). "The physical anthropology of the Maori-Moriori". The Journal of the Polynesian Society. 49 (1(193)): 1–15. JSTOR 20702788. ^ As Kerry Howe put it, 'Scholarship over the past 40 years has radically revised the model offered a century earlier by Smith: the Moriori as a pre-Polynesian people have gone (the term Moriori is now a technical term referring to those ancestral Māori who settled the Chatham Islands)' (Howe 2003:182). ^ a b Clark, Ross (1994). "Moriori and Maori: The Linguistic Evidence". In Sutton, Douglas G (ed.). The Origins of the First New Zealanders. Auckland: Auckland University Press. pp. 123–135. ^ Solomon, Māui; Denise Davis (2 September 2011). "Moriori". Te Ara: The Encyclopedia of New Zealand. Retrieved 4 May 2012. ^ Howe, Kerry R. (24 September 2011). "Ideas of Māori origins". Te Ara: The Encyclopedia of New Zealand. Retrieved 4 May 2012. ^ McFadgen, B. G. (March 1994). "Archaeology and Holocene sand dune stratigraphy on Chatham Island". Journal of the Royal Society of New Zealand. 24 (1): 17–44. doi:10.1080/03014223.1994.9517454. ^ King 2000, pp. 20–21. ^ Davis, Denise & Solomon, Māui (3 March 2017). "Moriori population of the Chatham Islands, 1800–1920". Te Ara – the Encyclopedia of New Zealand. ^ a b King 2000, pp. 26. ^ "The Encyclopedia of New Zealand". ^ King 2000, pp. 39–40. ^ a b Richards 2018, pp. 157. ^ King 2000, pp. 42. ^ a b King 2000, pp. 44–45. ^ King 2000, pp. 48–49. ^ King 2000, pp. 39–52. ^ King, M. The Silence Beyond. Penguin, 2011; p. 190. ^ King 2000, pp. 57–58. ^ a b King 2000, pp. 67. ^ Crosby, R. D. (2012). The Musket Wars: A History of Inter-iwi Conflict, 1806–45. Libro International. pp. 296–298. ISBN 9781877514449. ^ Diamond, Jared (1997). Guns, Germs, and Steel: The Fates of Human Societies. New York: W. W. Norton. p. 53. ^ a b King, M. The Silence Beyond. Penguin, 2011 ISBN 9780143565567; p. 190. ^ Petrie, Hazel (21 September 2015). Outcasts of the Gods? The Struggle over Slavery in Maori New Zealand. Auckland University Press. p. 36. ISBN 9781775587859. ^ Murihiku timeline (Abandoned website) Backup copy at the Wayback Machine. ^ Kopel et al., 2003. ^ King 2000, pp. 135. ^ King 2000, pp. 192. ^ a b Belgrave 2005, pp. 284–286. ^ Belgrave 2005, pp. 303–310. ^ "The Crown and Moriori signed an Agreement in Principle on 16 August 2017". www.govt.nz. Retrieved 3 February 2019. ^ "Negotiations result in agreement between Crown and Moriori over treaty claim". Stuff. Retrieved 3 February 2019. ^ Berry, Ruth (22 January 2005). "Chathams embrace peace ethic". The New Zealand Herald. Retrieved 26 October 2011. ^ McBryde, Brendan (18 August 2016). "Reaching a rare island getaway". brendan.mcbryde.nz. Fiordland Advocate. Retrieved 27 November 2016. ^ a b "Rohe". tkm.govt.nz. Te Puni Kōkiri, New Zealand Government. Retrieved 2 March 2016. ^ a b c d Shepheard, Nicola (17 November 2007). "Moriori renaissance". ISSN 1170-0777. Retrieved 3 February 2019. ^ a b c d Taonga, New Zealand Ministry for Culture and Heritage Te Manatu. "5. – Moriori – Te Ara Encyclopedia of New Zealand". teara.govt.nz. Retrieved 3 February 2019. ^ "Moriori revival". Stuff. Retrieved 3 February 2019. ^ "ABOUT US – Hokotehi Moriori Trust". Retrieved 3 February 2019. ^ Richards 2018, pp. 215–219. ^ King 2000, pp. 175. ^ "Moriori fight to save language". Newshub. 28 August 2016. Retrieved 4 February 2019. ^ "Vitriol in face of historic Moriori victory". 24 June 2001. ISSN 1170-0777. Retrieved 11 February 2019. ^ McKeen, Tony Wall, Chris. "Divided Tribe". interactives.stuff.co.nz. Retrieved 3 February 2019. ^ "Don Brash – Ragging on Te Reo". Radio New Zealand. 2 December 2017. Retrieved 15 December 2018. ^ Wheeler, Read (2016). Portrayals of the Moriori people : historical, ethnographical, anthropological and popular sources, c.1791–1989 : a thesis submitted in partial fulfilment of the requirements for the degree of Master of Arts in History, Massey University (Master of Arts in History thesis). Massey University. ^ says, Desechables Monterrey (25 March 2014). "Accumulated Histories and Disposable People in Cloud Atlas and the Black Atlantic". The Black Atlantic. Retrieved 15 December 2018. ^ mailevine (13 January 2014). "The Pacific Problems of Cloud Atlas". the maile vine. Retrieved 15 December 2018. ^ Petrie, Hazel (21 September 2015). Outcasts of the Gods? The Struggle over Slavery in Maori New Zealand. Auckland University Press. ISBN 9781775587859. Dave Kopel, Paul Gallant & Joanne D. Eisen (2003). 'A Moriori Lesson: a brief history of pacifism'. National Review Online, 11 April 2003.